The 50PN6500 is going to be a good seller this year because of its price. That's the primary reason, but also because if offers a very nice natural looking picture quality. The 2012 predecessor to this model was a very hot seller for months. This model is the second tier plasma for 2013/2014 in LGs lineup but that's not saying much since the company is only producing 3 models this year. It does not have the features of the higher end PN6700 such as Smart TV and 3D. The picture quality on LGs plasma TVs has improved significantly in the past couple years and the 50PN6500 series picture emanates a beautiful plasma image. These plasma TVs may look a little dim compared to LED TVs and are also less brilliant than the other two brands of Plasma TVs on the market. For that reason they may not look great in the store. But in a darker room at home colors and black levels come alive. Your living room is a lot different that a showroom floor and those LED are all on torch mode to make them look so much brighter. You would not use the TV in that way at home anyway. The 50PN6500 delivers some smooth contouring and though the upper limit of brightness is constrained it has a nice depth perception. Black levels are average on this TV for a plasma and better than most LCD TVs. All that being said, the LG 50PN6500 does not have as good brightness, light flow through and color saturation as 1080p Samsung and Panasonic plasmas. The 50PN6500 is not your best option for gaming when it comes to processing speed but it has no problem displaying fast motion objects without motion blur and the judder from side to side panning is not bad either. The 50PN6500 performs just like all the plasma TVs on the market today from side viewing angles – perfect. This is in great contradiction to the vast majority of LED TVs on the market which lose their contrast and black levels at contrast starting at 15 degrees off center and continuing on down the line. Manufacturers of LED LCD TVs never talk about the problem with off-center viewing on LED TVs. 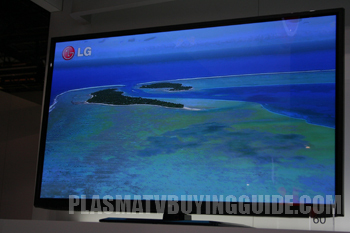 One of the best traits of LG TVs for 2013/2014 is the sound quality from their new speakers. Really they are the best in the market this year. The looks of this LG plasma are pretty standard less than 1 inch framing bezel and only 2.2 inches in depth in black gloss. I mean if you just want a good 1080p HD picture for a darker room at home how can you beat $599? You cant. If you are not interested in 3D, Smart TV or any of the fanciest features that higher end TVs have to offer and just want a good sports or movie TV then the 50PN6500 could be the answer. You certainly get great savings from 1) going plasma and 2) foregoing all the extra features. There still plenty of HDMI inputs and connectivity options. If you want Smart TV functionality you can simply purchase a $75 Roku box and plug in with an HDMI cable and get all the streaming content you want. Competition is from the Samsung PN51F5300.